All modules, projects and users are connected on one platform. Our comprehensive platform consists entirely of connected modules. Manage inspections, checklists and handover. Schedule inspections, track repairs and generate reports. Manage safety processes and related forms sites. Manage personnel and project teams in real time. Manage assets and equipment on multiple sites. Manage site activities’ progress and related tasks. Whether your team is using desktops, tablets, or mobile devices, everyone will stay on the same page. 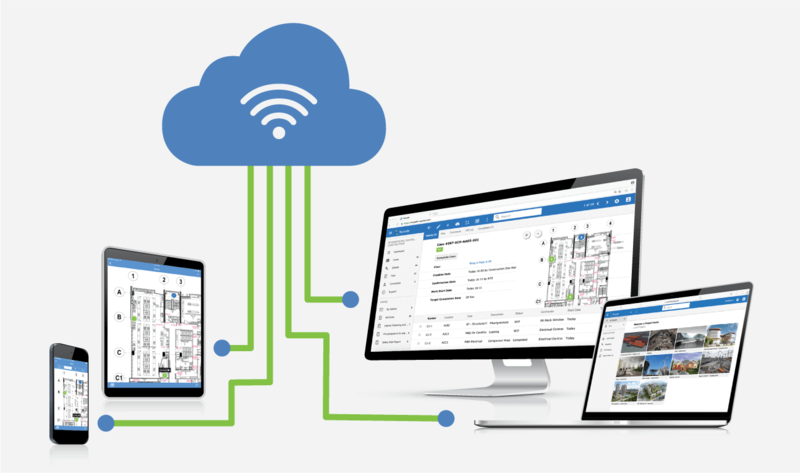 Not only is all project data synchronised across all of these digital platforms, but work can continue even when there is no Internet connection. Progress is saved while offline, then re-synchronised to our secure cloud servers once a connection is re-established. Access with secured login and passwords. All connections are encrypted with strict policies on data security & confidentiality. All modules work offline and online with 99.9% uptime service for synchronisation server. Data is backed up daily. Designed to handle hundreds of users and thousands of defects, pictures and checklists without any compromise on performance. Why Do Customers Choose Novade? Our approach aims to support your team in every stage. This includes functionalities suited to each user and every task throughout the project. Conveniently access project dashboards at any time from your computer, tablet, or mobile phone. Hassle-free setup so you can focus on what matters: we designed Novade to be deployed in record time. Effortlessly introduce Novade to your existing workflow with a wide selection of import and export options.